Through courses, cross-cultural-immersion experiences, mentorships, and more, this new Asian American Ministry program equips leaders to witness to the gospel of Jesus Christ. 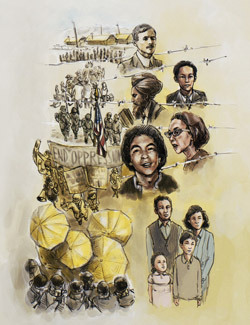 A poster celebrating Asian and Pacific Islander heritage was commissioned for the event from illustrator Moses Lee. The hyphen between two cultures — that’s how Harry Liang ’15 describes what it means to be Asian American in a video played May 5 at Seattle Pacific University’s first chapel service in celebration of Asian Pacific American Heritage Month. Organized by Seattle Pacific Seminary’s Asian American Ministry Program in partnership with University Ministries, the chapel was designed to honor the experiences, stories, and contributions of Asian American Christians. Guest speaker Jonathan Tran, an associate professor of religion at Baylor University, spoke on the persistence of the model minority stereotype, which masks a history of discrimination and socioeconomic disparity among Asians in the U.S., while also shaming other communities of color, by promoting the story of the highachieving Asian American as the “model” for other minority groups to emulate. Tran also led the discussion in a church leaders forum following the chapel, where Seattle Pacific faculty, as well as church and lay leaders, discussed the Asian American response to events in Ferguson, Missouri. Billy Vo, director of the Asian American Ministry Program and Seattle Pacific Seminary, hopes the event cultivated a deeper understanding of Asian American Christians, and their unique contribution to the ministry of racial reconciliation. Originally begun as an outreach and church relations resource for Asian American churches in Seattle, AAMP hosts forums, offers academic courses, and provides mentor opportunities and crosscultural immersion experiences for seminary students. Erin Rodenbiker, a 2013 MDiv graduate, participated in a 2012 trip in South Korea and says he is grateful AAMP courses were a required part of his degree. Rodenbiker, who is white, also says ministering in multiethnic communities has taught him the importance of learning from experienced leaders. AAMP also announced a new master of arts degree in Asian American ministry at the May forum. The degree will equip students for ministry in Asian American and multiethnic churches and communities through a deeper awareness of Asian American identity and experience. According to University Chaplain Bo Lim, the degree is also relevant for those who will serve outside the Asian American church.